The self-unloading cargo ship Roger Blough remained grounded in Lake Superior on Tuesday, four days since it ran aground on Gros Cap Reef in Whitefish Bay in Lake Superior. Combined efforts of US Coast Guard (USCG), salvage crews and the vessel’s Canadian owners Great Lakes Fleet are moving towards refloating the ship. 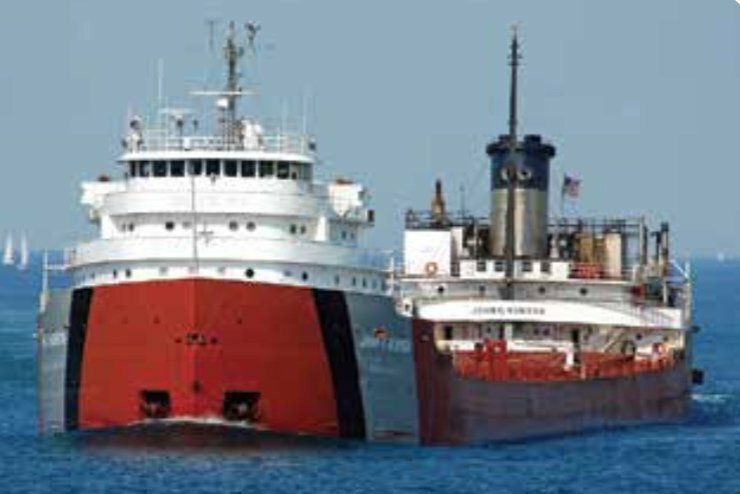 No injuries were reported in the grounding and all crew have remained aboard the 833-foot ship which sits about 10 miles from Sault Ste Marie in Michigan. It had been carrying a load of iron ore pellets from the Twin Ports (of Duluth, Minnesota and Superior, Wisconsin) to Conneaut, Ohio. USCG said it believes there has been no fuel pollution but containment booms were deployed around the ship’s stern and fuel tanks as a precaution. Officials from the US National Transportation Safety Board (NTSB) were due to arrive at the scene on Tuesday night to help the USCG’s investigation of what caused the grounding. Traffic continues to pass but a 500-yard safety zone is in force around the grounded ship.